This Cast Aluminum nameplate was taken from the No. 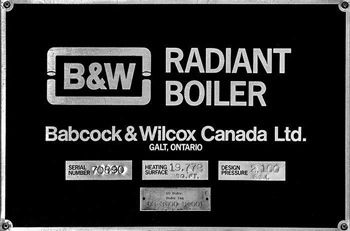 8 Babcock and Wilcox Boiler at the Rossdale Power Plant. These boilers supplied the steam required forsteam the turbines. The boilers installed between 1932 until 1950, were coal fired. They were converted to natural gas in 1951. Boilers installed after 1950 were capable of burning two fuels; natural gas or fuel oil (Bunker C oil). 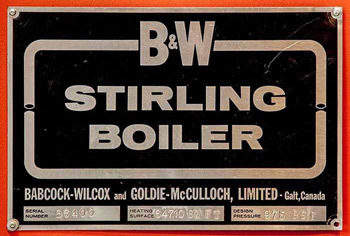 Each Babcock and Wilcox boiler had a Serial Number Plate attached to it. This particular plate is from the Rossdale No. 9 HP Boiler. Placed into service in July of 1963. Heating Surface: 64,710 sq. ft. This serial number plate is from Rossdale Power Plant Boiler No. 10. 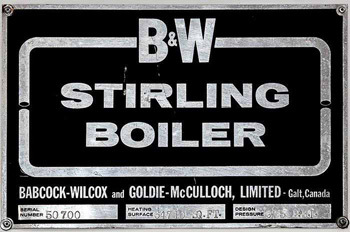 Each Babcock and Wilcox boiler at Rossdale Power Plant had a Serial Number Plate attached. Placed into service in October of 1966. Heating surface: 64710 sq. ft.
Each Clover Bar boiler had its own serial number plate. Heating surface: 79,778 sq. ft.